Barnyardgrass (Echinochloa crus-galli var. crus-galli) is a monocot weed in the Poaceae family. In Brazil this weed first evolved multiple resistance (to 3 herbicide sites of action) in 2015 and infests Rice. Multiple resistance has evolved to herbicides in the Groups A/1, B/2, and L/26. These particular biotypes are known to have resistance to cyhalofop-butyl, penoxsulam, and quinclorac (MOA in monocots) and they may be cross-resistant to other herbicides in the Groups A/1, B/2, and L/26. ABSTRACT - The objective of this research was to confirm the resistance of a barnyardgrass biotype (Echinochloa crus-galli) to herbicides quinclorac (synthetic auxin), penoxsulam (ALS inhibitor) and cyhalofop-butyl (ACCase inhibitor). Two experiments were carried out in a greenhouse located in Itajaí, State of Santa Catarina, Brazil. One experiment evaluating the biotype ECH 18 (known as susceptible) and one with the ECH 141 biotype (suspected to be multiple resistant). The experimental design used was completely randomized, in a 4 x 7 factorial arrangement with four replications. The first factor was the herbicide: cyhalofopbutyl (Clincher®), penoxsulam (Ricer®), quinclorac (Facet®) and propanil (Grassaid®) and the second factor consisting of seven rates of each herbicide (0.00; 0.25; 0.50; 1; 2; 4 and 8 times the label rate). The evaluations of percentage of control, plant density per pot and dry mass of shoots were performed 35 days after treatments. The rates to control 50% and 80% and the dose to provide 50% and 80% of the weed biomass accumulation and the resistance factor were estimated based on data analysis. The initial hypothesis was confirmed; the biotype ECH 141 presented multiple resistance (synthetic auxin, ALS and ACCase inhibitor). However, the herbicide propanil controlled biotype ECH 141 adequate. Recebido para publicação em 17.9.2015 e aprovado em 27.11.2015. Epagri, Estação Experimental de Itajaí-SC, Brazil, <noldin@epagri.sc.gov.br> e <dsavioe@gmail.com>; 3 Universidade Federal de Pelotas, Pelotas-RS; 4Agroas Agronomia Ltda. Tubarão-SC, Brazil. Greenhouse, and Laboratory trials comparing a known susceptible Barnyardgrass biotype with this Barnyardgrass biotype have been used to confirm resistance. For further information on the tests conducted please contact the local weed scientists that provided this information. There is no record of differences in fitness or competitiveness of these resistant biotypes when compared to that of normal susceptible biotypes. If you have any information pertaining to the fitness of multiple resistant Barnyardgrass from Brazil please update the database. The Herbicide Resistance Action Committee, The Weed Science Society of America, and weed scientists in Brazil have been instrumental in providing you this information. Particular thanks is given to Domingos Eberhardt, and José Noldin for providing detailed information. Xia Yang, Zichang Zhang, Tao Gu, Mingchao Dong, Qiong Peng, Lianyang Bai and Yongfeng Li. 2017. Quantitative proteomics reveals ecological fitness cost of multi-herbicide resistant barnyardgrass (Echinochloa crus-galli L.). Journal of Proteomics 150 : 160 - 169. 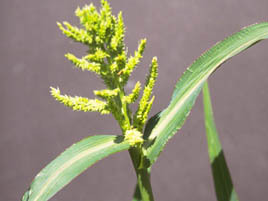 Barnyardgrass (Echinochloa crus-galli) is one of the top 15 herbicide-resistant weeds around the world that interferes with rice growth, resulting in major losses of rice yield. Thus, multi-herbicide resistance in barnyardgrass presents a major threat, with the underlying mechanisms that contribute to resistance requiring elucidation. In an attempt to characterize this multi-herbicide resistance at the proteomic level, comparative analysis of resistant and susceptible barnyardgrasses was performed using iTRAQ, both with and without quinclorac, bispyribac-sodium and penoxsulam herbicidal treatment. A total of 1342 protein species were identified from 2248 unique peptides by searching the UniProt database and conducting data analysis. Approximately 904 protein species with 4774 Gene Ontology (GO) terms were grouped into the categories of biological process, cellular component and molecular function. Among these, 688 protein species were annotated into 1583 KEGG pathways, with 980 protein species relating to metabolism and 93 relating to environmental information processing. A total of 292 protein species showed more than a 1.2-fold change in abundance in the resistant biotype relative to the susceptible biotype. Furthermore, herbicide treatment resulted in 157 protein species that showed more than a 1.2-fold change in the resistant biotype. Moreover, physiological analyses demonstrated an ecological fitness cost in the resistant biotype. Significance: While some studies have shown a fitness cost to be associated with an altered ecological interaction, our understanding of the fitness costs associated with herbicide resistance are limited. Herein, physiological and proteomic analysis demonstrates herbicide resistance associated ecological fitness cost and potential mechanisms of herbicide-resistance in resistant biotypes of E. crus-galli. The results presented herein have revealed differences in ecological adaptation between resistant and susceptible biotypes in E. crus-galli and provide a fundamental basis enabling the development of new strategies for weed control. Lastly, this is the first large scale proteomics study to examine herbicide stress responses in different barnyardgrass biotypes. Zichang Zhang, Tao Gu, Buhong Zhao, Xia Yang, Qiong Peng, Yongfeng Li and Lianyang Bai. 2017. Effects of common Echinochloa varieties on grain yield and grain quality of rice. Field Crops Research 203 : 163 - 172. Barnyard grass, such as Echinochloa crus-galli var. mitis, Echinochloa crus-galli var. zelayensis and Echinochloa colonum, are the main troublesome weeds in rice (Oryza sativa) paddies. This study aimed to investigate the rice yield (quality and quantity) when grown with these common barnyard grass varieties. A 2-year field experiment was conducted using two high-yielding rice cultivars, Liangyoupeijiu (an O. sativa indica hybrid cultivar) and Nanjing 9108 (an O. sativa japonica cultivar) at different develop-mental stages from transplant to maturity. Treatments included a weed-free (control), rice grown with Echinochloa. crus-galli var. mitis (Ecm), rice grown with E. crus-galli var. zelayensis (Ecz), and rice grown with E. colonum (Ec). The results showed that when barnyard grasses were grown with the same rice cultivar, the order of plant height of the three barnyard grass varieties was Ecz > Ecm > Ec, the growth duration was Ecm > Ecz > Ec and the dry matter accumulation of both Ecm and Ecz was greater than Ec. Compared with the weed-free control, there was no significance difference in rice tiller numbers among the treatments within the same rice cultivar. The Ecm and Ecz treatments for both rice cultivars and the Ec treatment of Nanjing 9108 had significantly lower leaf photosynthetic rate, root biomass, root oxidation activity, and dry matter accumulation at both the heading and maturity stages. Lower rice yield loss was detected for all rice grown with barnyard grass, but the loss in yield differed by treatments. Losses in grain yield of rice were 12.7–42.6% in the Ecm treatment, 22.3–55.2% in the Ecz treatment, and1.5–12.1% in the Ec treatment. For both rice cultivars, Ecm and Ecz treatments had significantly lower grain yield compared with the control. The Ec treatment for Nanjing 9108 had significantly lower grain yield compared to the control, but there was not a significant difference between Ec and the control for Liangyoupeijiu. In general, the japonica cultivar had a greater loss in grain yield compared with the indicia hybrid cultivar under the same treatment. The degree of yield loss by barnyard grass cultivar was Ecz > Ecm > Ec. Grain quality in head rice, chalky kernel, chalky size, and gel consistency was significantly lower for both rice cultivars in the Ecm and Ecz treatments and also for Nanjing 9108 but not for Liangyoupeijiu in the Ec treatment. We conclude that the reduction in leaf photosynthetic rate, root biomass, root oxidation activity at the grain filling stage, and dry matter accumulation at maturity was caused by interference in canopy light transmission caused by barnyard grass and that these factors resulted in losses in grain yield and quality..
Panozzo, S., L. Scarabel, V. Rosan, and M. Sattin. 2017. A New Ala-122-Asn Amino Acid Change Confers Decreased Fitness to ALS-Resistant Echinochloa crus-galli.. Frontiers in Plant Science https://doi.org/10.3389/fpls.2017.02042 : . Gene mutations conferring herbicide resistance may cause pleiotropic effects on plant fitness. Knowledge of these effects is important for managing the evolution of herbicide-resistant weeds. An Echinochloa crus-galli population resistant to acetolactate synthase (ALS) herbicides was collected in a maize field in north-eastern Italy and the cross-resistance pattern, resistance mechanism and fitness costs associated to mutant-resistant plants under field conditions in the presence or absence of intra-specific competition were determined. The study reports for the first time the Ala-122-Asn amino-acid change in the ALS gene that confers high levels of cross-resistance to all ALS inhibitors tested. Results of 3-year growth analysis showed that mutant resistant E. crus-galli plants had a delayed development in comparison with susceptible plants and this was registered in both competitive (3, 7, and 20 plants m-2) and non-competitive (spaced plants) situations. The number of panicles produced by resistant plants was also lower (about 40% fewer panicles) than susceptible plants under no-intraspecific competition. Instead, with the increasing competition level, the difference in panicle production at harvest time decreased until it became negligible at 20 plants m-2. Evaluation of total dry biomass as well as biomass allocation in vegetative parts did not highlight any difference between resistant and susceptible plants. Instead, panicle dry weight was higher in susceptible plants indicating that they allocated more biomass than resistant ones to the reproductive organs, especially in no-competition and in competition situations at lower plant densities. The different fitness between resistant and susceptible phenotypes suggests that keeping the infestation density as low as possible can increase the reproduction success of the susceptible phenotype and therefore contribute to lowering the ratio between resistant and susceptible alleles. If adequately embedded in a medium or long-term integrated weed management strategy, the presence of R plants with a fitness penalty provides an opportunity to minimize or reverse herbicide resistance evolution through the implementation of integrated weed management, i.e., all possible control tools available..
Riar, D. S. ; Norsworthy, J. K. ; Srivastava, V. ; Nandula, V. ; Bond, J. A. ; Scott, R. C.. 2013. Physiological and molecular basis of acetolactate synthase-inhibiting herbicide resistance in barnyardgrass (Echinochloa crus-galli). Journal of Agricultural and Food Chemistry 61 : 278 - 289. Barnyardgrass biotypes from Arkansas (AR1 and AR2) and Mississippi (MS1) have evolved cross-resistance to imazamox, imazethapyr, and penoxsulam. Additionally, AR1 and MS1 have evolved cross-resistance to bispyribac-sodium. Studies were conducted to determine if resistance to acetolactate synthase (ALS)-inhibiting herbicides in these biotypes is target-site or non-target-site based. Sequencing and analysis of a 1701 base pair ALS coding sequence revealed Ala122 to Val and Ala122 to Thr substitutions in AR1 and AR2, respectively. The imazamox concentrations required for 50% inhibition of ALS enzyme activity in vitro of AR1 and AR2 were 2.0 and 5.8 times, respectively, greater than the susceptible biotype. Absorption of 14C-bispyribac-sodium, -imazamox, and -penoxsulam was similar in all biotypes. 14C-Penoxsulam translocation out of the treated leaf (≤2%) was similar among all biotypes. 14C-Bispyribac-treated AR1 and MS1 translocated 31-43% less radioactivity to aboveground tissue below the treated leaf compared to the susceptible biotype. 14C-Imazamox-treated AR1 plants translocated 39% less radioactivity above the treated leaf and aboveground tissue below the treated leaf, and MS1 translocated 54 and 18% less radioactivity to aboveground tissue above and below the treated leaf, respectively, compared to the susceptible biotype. Phosphorimaging results further corroborated the above results. This study shows that altered target site is a mechanism of resistance to imazamox in AR2 and probably in AR1. Additionally, reduced translocation, which may be a result of metabolism, could contribute to imazamox and bispyribac-sodium resistance in AR1 and MS1..
Huan ZhiBo ; Xu Zhi ; Lv DaiZhu ; Wang JinXin. 2013. Determination of ACCase sensitivity and gene expression in quizalofop-ethyl-resistant and -susceptible barnyardgrass (Echinochloa crus-galli) biotypes. Weed Science 61 : 537 - 542. Mechanisms of herbicide resistance were studied in a quizalofop-ethyl-resistant barnyardgrass biotype. Acetyl-coenzyme A carboxylase (ACCase) sensitivity to quizalofop-p-ethyl was measured by high-performance liquid chromatography and the trend in ACCase gene expression over time was determined using real-time polymerase chain reaction. The results showed that an insensitive ACCase was present in Geqiushan resistant plants (R), with a resistance index of 106. The basal ACCase activities in Geqiushan R and Geqiushan susceptible plants (S) were similar, at 1.20 and 1.17 ng malonyl-CoA min-1 µg-1 extract protein, respectively. Basal ACCase gene expression in Geqiushan R was similar to that in Geqiushan S. The relative expression of ACCase gene decreased after spraying quizalofop-ethyl at 60 g ai ha-1 in Geqiushan S, whereas it was almost not changed in Geqiushan R. From these results we concluded that plastid ACCase sensitivity change might be responsible for the resistance and gene overexpression does not play a role in this resistance..